Upgrading the monitors here at the Grey Brick Recording Studio has been on the to do list for a while. Up until now I have been working on my trusty Mackie MR8 MKIIs, and while they have served me very well for years I started to notice their limitations. When I moved the studio down here to San Diego, one of my main goals was to improve the accuracy of my monitoring. My first focus in the new studio was to invest a lot into the acoustics of my control room by building more effective bass traps and adding more broadband absorption and diffusion, since it’s a good rule of thumb to make sure the room sounds good before investing a lot into monitors themselves. Working on the room greatly improved the sound of my monitors but it also started to reveal some of their shortcomings. Once I finished treating the new room I realized that I had invested three times the amount my Mackies are worth on the acoustics, so I thought maybe it was finally time to upgrade. The main things I was looking for in a new set of monitors was a more full and accurate bass, and smoother less harsh upper mids and highs. I narrowed my search down to two pairs: Dynaudio BM5 mkIIIs and Adam A7Xs. I demoed the Dynaudios at a store here in San diego, and while I was very impressed with the bass, I felt like there was something missing and a little empty in the mids. I also felt like the high end might be a little grating after long hours of use. I didn’t get a chance to listen to the Adams A7Xs personally, but I got a very good recommendation for them from another engineer I used to work with who uses them in his personal studio. So after crossing the Dynaudios off my list I decided to go with the Adams. After working on the Adams A7Xs for a couple weeks now, I can say that they are awesome and I am very satisfied. The bass is indeed much fuller and more even than on the old Mackies. The front ports on the Adam A7Xs really help move a lot more air, and I think that having the ports on the front of the speaker rather than in the rear (like the Mackie MR8 MKIIs) helps to keep the bass more even throughout the room by avoiding putting as much bass energy in the corners. I was also pleasantly surprised at how smooth the high end is. Adam uses a unique ribbon tweeter design that allows their speakers to reproduce extremely high frequencies. Because of this, I assumed that the A7Xs might be pretty bright, but instead I found that the high end is very pleasing. Another side effect of the smoothness in the highs is the Adam A7Xs have a lower apparent volume than the Mackie MR8 MKIIs did. If I set both sets of speakers to a level of about 85 decibels with a sound pressure meter the Adams just feel a little quieter and less in-your-face. This is great because it means that they seem to fatigue my ears significantly less after a full day of mixing than my old Mackies did. Finally, the new monitors have a much better transient response. Everything just sounds a little bit sharper and more clearly defined. As a result of upgrading the monitors in the recording studio, my mixes have been translating significantly better outside of the room here at the Grey Brick. This means my mixes sound more consistent across more playback systems in different settings. The new speakers help me get better results and make mixing more enjoyable. Overall I am very happy with the upgrade. Last year, I bought a pair of MXL R40 ribbon microphones for the studio. These mics aren't the most amazing mics ever, but they were cheep enough that I decided to get a couple to play around with. After experimenting with them for a while, I discovered that they actually worked quite well for some things. I really like them as drum room mics, and they blend well with other mics on guitar amps. But unfortunately, these mics have a pretty big limitation which is they have a pretty poor signal to noise ratio and their output is really, really low. This meant that if I tried to record anything quiet with these mics the result wasn't always very usable since the mics have a high self noise and then extra noise is introduced when adding a lot of gain on a preamp to compensate for the low output. A couple months ago I came across an article online about a simple modification for these mics. It said that by replacing the low quality, made in China, transformer, with a higher quality transformer that is made in the US, the mics would have less self noise, a higher output, and a better frequency response. Naturally, I was very interested, so I ordered two of the higher quality transformers. I finally got the transformers last week and I got to work. It was a pretty easy process. I just had to open them up, unsolder the old transformer from the ribbon and the output, pull it out, and then solder the new one in. Once I was done, they did indeed sound better than before. It seems like they capture more "airy" high frequencies and have a little less noise. So I'm really happy about that. Unfortunately, the overall output level did not increase as much as I would like. I think I got about additional 2-3 decibels of output, which is nice, but the article I read claimed that the output increased by about 5 decibels. My original hope for this modification was that increased output would enable me to use them on really quiet sources (such as a few feet away from an acoustic guitar,) but they still have too low of an output to really make this practical since ribbon microphones in general have very low outputs and require a lot of gain from a preamp. I'm not too disappointed though, I will continue to use them in the same way as drum room mics and on guitar amps and the better frequency response will definitely be beneficial in those applications. And besides, I just got an amazing acoustic guitar tone during a session this week by using the Lewitt LCT 940 and Rode NTK in the way that I was hoping to use R40s. Yesterday I finally went to pick out a new high end large diaphragm microphone since I've been feeling that there was room to improve the quality of the vocals I've been recording here at The Grey Brick. For about the last year, my go to mic for vocals has been the AKG c414-ULS, and before that I was using the Rode NTK. Both of those mics are wonderful and have served me well, but I have never been 100% satisfied with how they performed on vocals. The NTK has a nice brightness to it, which helps it cut through the mix, but sometimes I feel like it doesn't authentically reproduce the lower "body" part of singer's voices. Also, because of its brightness, the NTK tends to over exaggerate vocalist's sibilance ("s" sounds or other sounds that involve air moving through teeth.) Because of those two problems, I found myself gravitating towards the 414 since it has a more full body sound and a softer top end. However, this sometimes caused the 414 to have a somewhat "muddy" sound to it that has more trouble cutting through in a dense mix. So when I started searching for a new mic, my goal was to find one that could combine what I liked about the 414 and the NTK without their drawbacks: a strong body without being muddy, and a bright and exciting top end without being harsh. That's exactly what I found in the Lewitt LCT 940. It has the body and warmth and also a great top end that really cuts through. 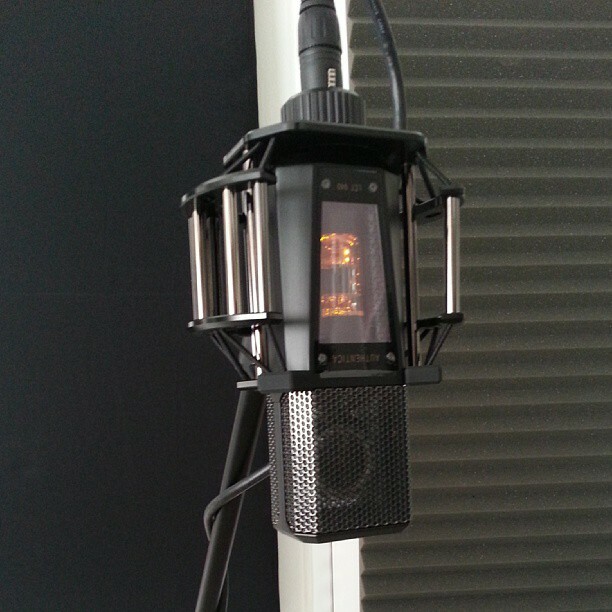 The Lewitt LCT 940 is a very unique microphone because it features a fully tube circuit as well as a fully FET circuit (solid state.) The tube side has the nice, classic, smooth and warm sound, while the FET side is known for being very clear and rich. The LCT 940 allows me to mix and blend these two sounds which gives the mic a lot of flexibility. In addition to vocals, I look forward to using the LCT 940 on electric and acoustic guitars, upright basses and bass amps, and toms and kick drums. I'm really excited to get to use this new tool to help the artists I work with sound even better. Now, instead of starting with an okay vocal sound and making it sound good in the mix, I'll be able to take a great vocal sound and make it amazing. There are currently 23 songs in progress at The Grey Brick and this new mic is really going to help put the finishing touch on all of them. Square Capital, LLC provides financing options for eligible purchases at our studio. To apply, click here for more details. We are an independent third party from Square, Inc. and Square Capital, LLC. All loans are issued by Square Capital, LLC,. a wholly owned subsidiary of Square, Inc., d/b/a Square Capital of California, LLC in FL, GA, MT, and NY. Loans are available in select states. Square and the Square logo are trademarks of Square, Inc. Other trademarks and brands are the property of their respective owners.